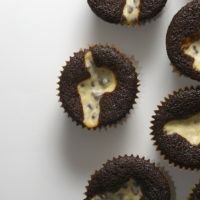 I was recently lucky enough to be offered an advance copy of The Sweet Melissa Baking Book. 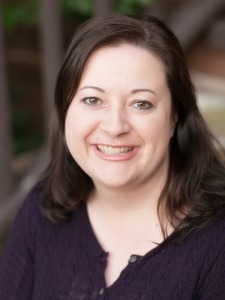 The book’s author is Melissa Murphy, the chef and owner of Sweet Melissa Patisserie in Brooklyn, New York. This book is packed with over 100 recipes, and I would love to try just about all of them. There is s Sweet Almond Bread Pudding with Raspberry Sauce that I’m saving for a special occasion. I’m also eyeing her Brooklyn Brownout Cake and Lemon Coconut Macaroons. After bookmarking several, I decided on these bars. 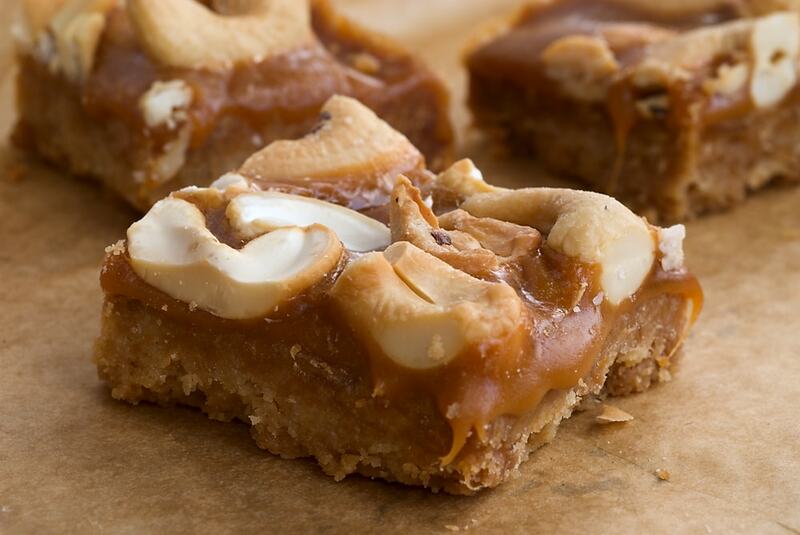 They feature a shortbread crust, topped with butterscotch caramel and cashews. Melissa laments that cashews aren’t used nearly enough in baking, and I have to agree. Along with pecans and hazelnuts, cashews are one of my favorite nuts. I was certainly not disappointed by my first recipe attempt from Sweet Melissa. 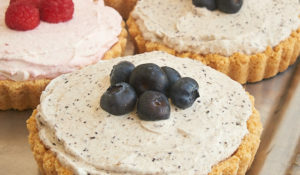 The shortbread crust is so simply delicious. A simple combination of butter, brown sugar, salt, and flour lends itself to a crust so good I could have stopped right there and been happy. I am not usually much of a butterscotch or caramel fan. I used the best butterscotch chips I could find, and I really think that made a big difference. I thought the finished bar had more of a mild caramel flavor than butterscotch. I really liked the saltiness that carries through from one layer to the next. These bars are certainly unlike anything I have ever made. While we are frequent New York visitors, I’ve never been to Sweet Melissa Patisserie. I intend to remedy that on one of our next trips. I can’t wait to sample some of her delicious baked goods in person. Update: Sweet Melissa closed her bakery in 2013. 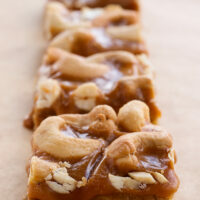 Butterscotch Cashew Bars are a delicious blend of sweet shortbread, rich shortbread, and crunchy cashews. Preheat oven to 350°F. Spray a 9″x 13″x 2″ pan with cooking spray. 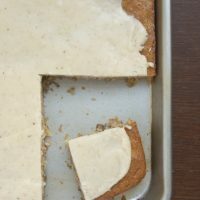 Using two sheets of parchment paper, line the pan’s width and length, creating a parchment “sling.” Spray the parchment paper with cooking spray. 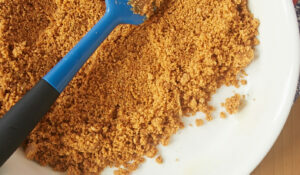 Using an electric mixer on medium speed, beat the butter, brown sugar, and salt for 1 to 1 & 1/2 minutes. Decrease mixer speed to low and add the flour. Mix just until combined. Lightly press the dough evenly into the prepared pan. Poke holes in the dough with a fork. Bake for 30 to 40 minutes, until the crust is a golden color. Remove to wire rack to cool. In a heavy saucepan over low heat, stir together the butterscotch chips, corn syrup, and water. Stir until the mixture comes to a simmer and the butterscotch chips are melted. Pour over the crust. Sprinkle the cashews over the butterscotch caramel. Bake for 5 minutes. Cool completely on a wire rack. After cooling, remove from pan and use a very sharp knife to cut into bars. Recipe slightly adapted from The Sweet Melissa Baking Book. I can’t wait to get this book. I am reviewing it too. If this is an example, I will be watching my mailbox. butterscotch AND cashews? lordy, lordy, that’s a winning combination. they look heavenly! If I were small enough, I would sleep on that. I’m so glad you made these! I received my review copy and decided just this morning what I’ll be making as my test recipe (pistachio thumbprints). As everything on your blog goes, these look terrific! Yum! These look delicious! I’m curious… is the shortbread crust super moist or more dry/crumbly? 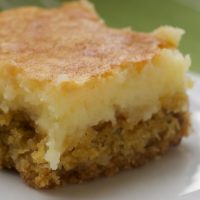 I’ve been trying to find a moist, very buttery shortbread crust recipe and from the pictures… this one looks like it might fit the bill. These bars look good! Like you Jennifer, I’m not a big fan of butterscotch or caramel. But I just might have to give these a try. Those bars look amazing! I love cashews! Peabody, I’m anxious to see what you make from this book. a. grace, the combination is definitely a winner. Graeme, you’ve certainly given me a good laugh for the day. These might feel a bit lumpy, but somehow I don’t think I’d mind. Deb, I gave some serious thought to those Pistachio Thumbprints. I’ll be on the lookout for yours. Amy, the crust is not very crumbly. It’s quite compact. It is definitely buttery, but I wouldn’t really describe it as either dry or moist. That’s not helpful, is it? I think it would seem moister if it were not as thick. Plus, the caramel is so soft that it really emphasizes the firmness of the crust. Cindy, let me know what you think if you try them! Brilynn, I love cashews, too, but I usually just eat them instead of baking with them. 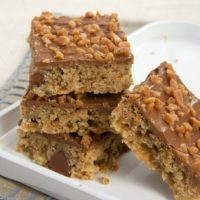 I am usually not a caramel/butterscotch fan, but after reading your description of this recipe, I may give this recipe a try sometime. 🙂 Of course I need to hunt for some nice butterscotch chips first. It doesn’t get any better than this!! I can’t wait until I can get a copy of this book in my hands! 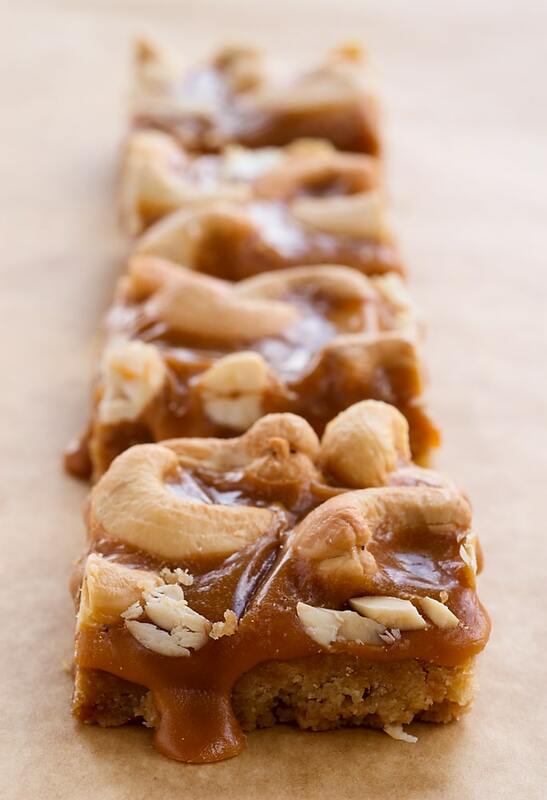 Mmmm, those Butterscotch Cashew Bars would work perfectly for my sweet tooth. Delicious! Those look so delicious and the photos are making my mouth water! I’m saving this one to del.icio.us! Without question I am making these, I already know that I will love them. i need that book, because i need to make these bars. they will last all of 3 second in my house. Ohh, that melty butterscotch looks fantastic. Beautiful photos. You´re great darling. Great for posting and sharing these wonderful recipes and great for the pictures¡¡ they´re beautiful. Best regards from Spain. Drool! That looks to good. Sorry I wish I could say more but I am drooling too much! Holly molly! Does that look good or what??? that’s the gooesiest thing I have seen in a while! Gorgeous! Jen, I bought a bag of salted cashew nuts to nibble but there’s a ton left still… Now I know what I’ll do with them! These look superb, my friend. Thanks, y’all! I still don’t have adequate words for how good these are. mmm..butterscotch and cashews? wow, what a fantastic combination! My Sweet & Saucy, I remember liking the sounds of that cake. Coconut cake is one of my favorites. marye, it truly is delicious. These just made my mouth water! The saltiness of the cashews alongside the sweet butterscotch sounds dreamy. OMG, those bars look extremely scrumptious and dirty! Wow, a fantastic combination!!! Wow, those bars look incredible. 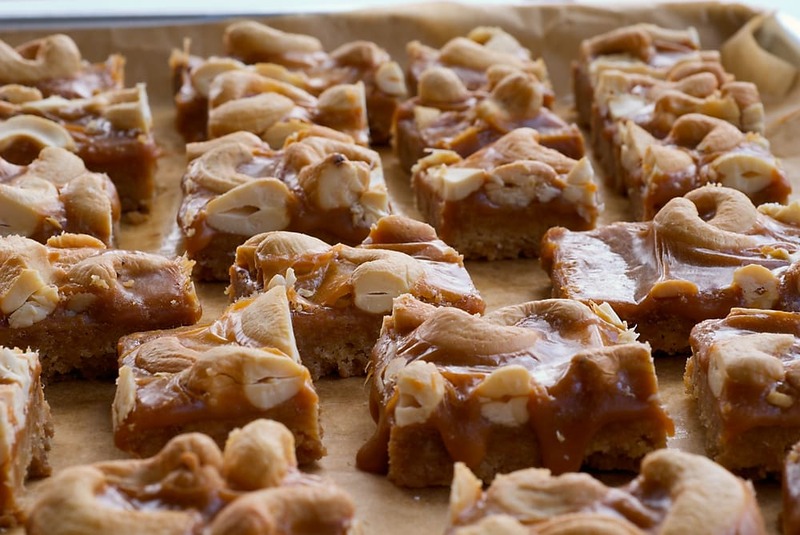 I just made some butterscotch bars that were just “eh” — wish I had thought of cashews! I made these last night! oh my god. Delicious. I could eat them allll night long! If you like butterscotch and cashews (both are my favorites) you’ll love these. I highly recommend them. really liked them. I brought some to work with me this A.M. and they liked them as well! I will be making them again. Do you think I could substitute golden syrup or honey (or something else entirely) for the light corn syrup? Tracy, I’m not much of a butterscotch fan, but these cashews really made a great flavor combination. Laura, I’m so glad you liked them! Cindy, it’s good to hear that these were a hit for you! Chrissie, I don’t do much baking with either golden syrup or honey, so I really can’t give you an informed answer to your question. I can only suggest giving it a try. Something else may very well work, although it might change the consistency. Let me know what works if you give it a try. I am reviewing too this weekend. I was on a lemon kick with some of her recipes and they all turned out great! These were high on the list too but have not got the chance to make them yet, but now that I see how they turned out, I know what I’ll be making this weekend! Yum!! Hi everyone, I am the author, Melissa!, and I want to thank you for the kind words! You can buy the book many ways, one of which is through my website, http://www.sweetmelissapatisserie.com. I assure you, as Jennifer said, these bars are awesome. Chrissie, you can absolutely sub out the corn syrup with Lyles Golden or a mild honey, just stir a bit more. No problem. I LOVE honey in caramel and butterscotch. Let me know how you like the others!! Tartelette, your recipes from this book look delicious! Of course, your baking creations always do. Melissa, thanks so much for stopping by! I am loving getting to know your new book. oooo-great!! Keep baking Jennifer- I won’t let you down!! These cashew bars look simply fabulous. Cashews are my favorite nuts. I’ll have to try this recipe and pick up Melissa’s book. Sheltie Girl, I hope you like them! There are so many tempting recipes in that book. Steamy, that doesn’t sound like a bad idea! I thought I’d mention I tried making these after seeing your wonderful picture and I found them to be incredibly sweet and a rather disturbing bright orange colour. I’m thinking not all butterscotch chips are created equal? They tasted a bit chemically too. Jenny, that’s interesting. I don’t know what to tell you. I loved these bars! Sorry you had bad luck with them. I really think the key to making these bars taste good is having good butterscotch chips. I can only find Nestle chips and they aren’t too good and they are too orange. Do you have any suggestions? I thought about buying some from the King Arthur site. Has anyone tried those? Judy, I’ve never used Nestle’s butterscotch chips. That very well could be the difference. I am 99% sure that I used Guittard brand that I picked up at World Market. I’ve not used the ones from King Arthur, but if their other products are any indication, I’m sure they would be good quality. Yummy, Yummy, Yummy what else can I say. Those cashew bars look amazing! Thanks, Chuck! They are quite delicious. I made 2 batchs of these over the weekend after hearing about them on a radio show. Tried 2 different versions, calling for the same ingredients, but different measures.. This recipe was fantastic!!! The are gooey and VERY rich. I have to make another batch tonight for my husband to take to work tomorrow. They keep well in an airtight container. Thanks for sharing!! T Severino, aren’t they delicious? I’m glad you liked them. Can’t believe you would post such scrumptious pictures and leave us hanging with no recipe. I love cashews and would love to have tried this recipe. I cannot afford to buy an entire cookbook for just 1 recipe. So sorry!!! Didn’t see the “Printable” link at the top of the page. My mistake! How should I store these want to give as gifts for Christmas how LNG will they keep out of fridge? Gallmarie, I would store them either in a single layer or with parchment paper or waxed paper in between layers. In an airtight container, they should keep for about 3 days. You shouldn’t need to refrigerate them. I would love to make these. I have checked both Guittard and King Arthur sites and neither have butterscotch chips. I know I dislike the Nestlé brand. Any suggestions? JEP, I’m not a fan of Nestlé’s butterscotch chips, either. Try World Wide Chocolate: http://worldwidechocolate.com/shop_guittard_105.html. is there a substitute for butterscotch chips? Hi, Maria. 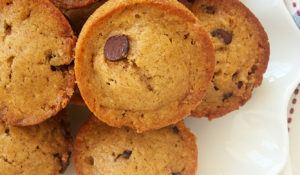 You can substitute another flavor chips – chocolate, peanut butter, etc. If you want butterscotch chips but don’t have access to them, google “how to make butterscotch chips,” and you’ll find many homemade versions. I’ve not tried any of them. Hi, Bruce. I don’t generally provide nutrition information for recipes. I view these recipes as indulgences for occasions when you aren’t counting calories. There are several nutrition calculators online at sites like My Fitness Pal. Would you say these ship well??? I bake goodies for all the mommas in my life and ship them. Hi, Cori. These bars are pretty sturdy. If you wrap and pack them well, I think they’ll ship just fine. Made these and they are WONDERFUL! I did the boozy version and embellished the butterscotch caramel layer with a bit of bourbon and butter. And, I did bring it to a simmer which is key to getting a soft caramel. I used Guittard butterscotch chips, which I’m surprised one of your readers couldn’t find. Plus, KAF carried the Guittard bs chips. Excellent bar, Jennifer! P.S. I even purchased Melissa’s book, so I’m very excited to bake even more of her creations…So appreciate your review and recipe. Thank you! LOVE the boozy version! I must try that. I just made these and I agree with the others… the butterscotch chips & corn syrup were not that great.. I happened to have a fantastic “from scratch” butterscotch recipe, so I made an alternative batch of butterscotch just in case the orange one didn’t taste good, and it didn’t. Try simmering 4 TBL butter in a sauce pan and adding a cup of brown sugar, stir with wooden spoon as sugar melts and blends with the butter. Then add 1 1/2 c cream (a half cup at a time). The sugar will seize at first and then it will melt again and all blend into an incredible homemade caramel/butterscotch. Put that on top of the shortbread crust and it’s heavenly! I used chopped pecans instead of cashews (coz I didn’t have any) and they turned out AWESOME!!!! Hubby said….”mmmm very good dessert!” I served them with a little bit of vanilla ice cream!!!! Thank you for the recipe!!!! 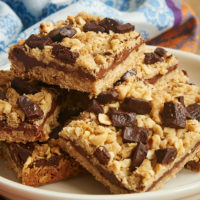 I want to make these gooey delicious bars! I have butterscotch syrup. Would that work the same or should I stick with the chips? Hi, Pat. I’ve not tried that, so I can’t say for sure. You’d need a fairly thick sauce, I think. Try a can of dulce del leche from the mexican food section of your grocery store. Fabulous and easy? I added whole roasted almonds too and sprinkled top with just a tiny bit of kosher salt. Over the top good! I love the idea of these with almonds! “Bake for 5 minutes”?? I don’t think so. At the top of the recipe, it says 55 minutes, which seems like too long. Does anyone know the correct baking time?? Thank you! Oops!! I read the recipe 3 times and completely missed the earlier baking time for the base. Now the 5 minutes makes sense for the topping . . . The 5 minutes is just the last step of baking. If you look at step 2, there’s an initial baking of the crust. The remaining cook time listed is for the stovetop portion of the recipe in step 3.